Fact one: Last Friday, the nation’s debt exceeded $20 trillion for the first time in its history. Fact two: Interest rates — the cost of debt — are at their lowest levels in recorded history. Never has debt scaled such heights… never have interest rates plumbed such depths. Each fact is remarkable in itself. But taken together? Richard Sylla professes economics at New York University. He’s also co-author of A History of Interest Rates (available through Amazon at a bargain-bin $68 per). This book canvasses 5,000 years of interest rates… from ancient Babylonia to the glories of Greece and Rome… the Renaissance, the age of empires… all the way through to the 21st century. Each period is distinct. And the investigator in search of meaningful comparison can easily be thrown off the scent. After peaking at the top left of the “U,” interest rates begin a downward cycle. And Sylla’s research shows that as interest rates fall… civilization rises. These civilizational heights bring heroic deeds… great achievements… and golden ages. Sylla claims this pattern was visible with Babylon, Greece, Rome. Bawerk declared that the cultural level of a nation is mirrored by its rate of interest: The higher a people’s intelligence and moral strength, the lower the rate of interest. But eventually the gods grow anxious of man’s advancing knowledge… his increasing achievements… his ascent up Olympus. The gods begin to fidget with man’s interest rates. The pace of civilization slackens… and the flame of achievement fades. Sylla notes that civilizations fatten on cheap debt. And when interest rates begin rising, the burden of that debt also rises. Civilization rises with falling interest rates. Drunk with debt, civilization falls with rising interest rates. 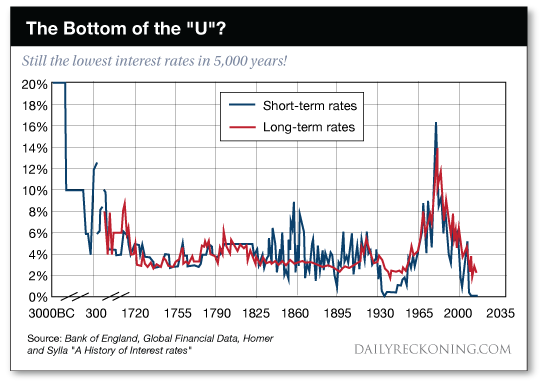 Question: Are interest rates at the bottom of the “U” — and due for a sharp rise? 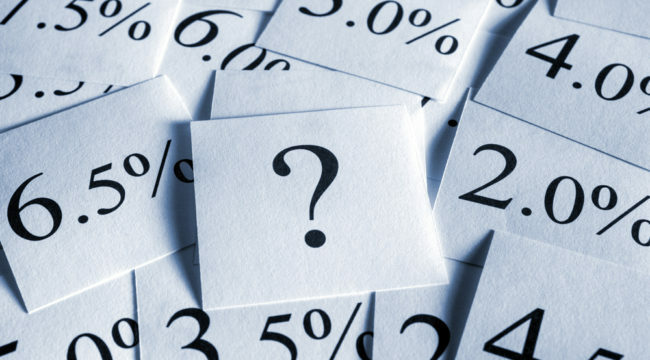 Interest rates have begun to rise recently — if barely — and haltingly. If rates rise meaningfully in the years to come, does it mean civilization is in for a sharp “decline and fall” as happened with civilizations past? We might say that our current low interest rates indicate that we’re at one of the high points of our civilization. Maybe things will get worse from now on. Recall that civilizations fatten on debt in a falling rate environment… and collapse under that debt as interest rates rise. Last Friday, the national debt exceeded $20 trillion for the first ever. 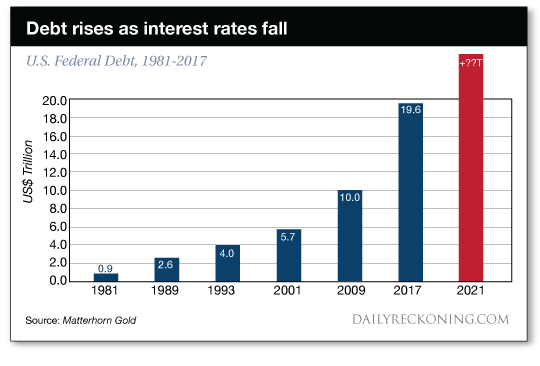 How will America service that debt if rates begin climbing… and return to historically normal levels? If the interest rate on that debt were to rise by even 1%, the annual federal deficit rises by $200 billion. A 2% increase in interest rate levels would up the federal deficit by $400 billion, and if rates were 5% higher, the annual federal deficit rises by a full $1 trillion per year. The chart above reveals that rates 5% higher are rates well within historic norms.